America’s often-watched millennial generation, traditionally viewed as young and unattached, has grown old enough to have children. Among the older half of millennials, those between ages 25-34, there are now 10.8 million households with children. Further, with millennials accounting for 80% of the 4 million annual U.S. births, the number of new millennial parents stands to grow exponentially over the next decade. A new study of 25-34 year-old parents reveals how starting a family has changed—or not changed—this generation’s behavior, values, media consumption and buying habits. The two-part “Millennials as New Parents” study first analyzed exclusive research records of 10,800,000 millennials with children. The second phase included a one-to-one survey of 1,000 American adults aged 25 to 34 who have children living with them. What one retailer would millennial parents shop at for the rest of their lives? When given the choice to shop at one store for the rest of their life, millennial parents gave a surprising answer. 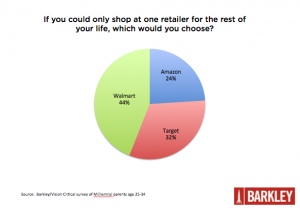 Between Amazon.com, Wal-Mart and Target, millennial parents chose Wal-Mart. Even as the world’s most tech-savvy generation, millennials who have kids opted for the brick-and-mortar locations of Wal-Mart and Target over online darling Amazon.com. When broken down by income level, the answer shifts slightly. High-income millennial parents chose Target, while middle and low income brackets chose Wal-Mart. Overall, those millennial parents who chose to shop at only Amazon for the rest of their life tend to be the most conservative politically. They still supported Barack Obama in the last election, but by a much smaller margin than those who prefer Walmart or Target. Plus, they are less likely to say they have become more politically liberal since they had kids than the other groups. How do millennial parents shop? Before they become parents, millennials rank their favorite brands in order of descending importance as Nike, Sony and Gap, with 10% naming Nike as their top choice. After they become parents, millennials continue to name Nike as their top affinity brand, but at a much lower margin. Only 6% put Nike at the top—followed by Target and Apple at 3% each. Millennial parents are pragmatic—when compared to before they had children, they buy significantly more based on price than they do on quality. Before they were parents, their buying decisions were 57% on quality. After parenthood, they buy just over 50% on quality. In some categories—dining and entertainment, apparel, and digital products—the change is more dramatic, with the shift away from quality and toward price dropping as much as 20%. Fifty percent of millennial parents agree with the statement “I am raising my kids the way I was raised,” while 28% disagree and 22% are neutral. So where do the differences and similarities lie? environmental issues and what their kids eat, with 52% saying they closely monitor their children’s diet and 64% saying the environment has become a top concern now that they are parents. Boomers, which are often cited as the inventors of the “helicopter parent” phenomenon, may have provoked something of a backlash, now that their millennial children are parents. For example, 61% of these young parents agree, “kids need more unstructured playtime.” Only 21% think their own kids are overscheduled. What do millennial parents value? When shopping for products, 50% of millennial parents say they try to buy products that support causes or charities. In fact, of the brands that millennial parents favor most—Nike, Target and Apple—every single one has a cause platform. Nike, through its Nike Better World initiative, addresses social issues including health and wellness, Native American culture and sustainability. Target is deeply embedded in the cause arena, with its giving programs covering issues including education, hunger, health and the environment. Apple is an active member of Product (RED) and focuses a large part of its cause effort on sustainability. When answering the question, “I want my kid(s) to_______”, millennial parents offered insight into what they value most. 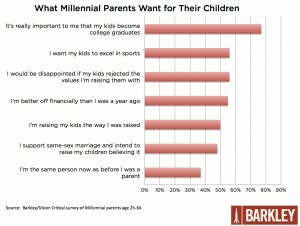 Ranked in order of importance, 82% want their child to know that they don’t need possessions to make them happy, 77% want their child to graduate college and 56% want their child to excel at sports. Millennial parents are politically very similar to millennials in general. They voted 58% for Barack Obama—very close to most of the exit polls for millennials in general. Now that they’re parents, millennials have become more interested in politics—43% are more interested compared to 36% who are not. However, only 30% say they’ve become more politically liberal than before they were parents. How do millennial views on privacy change after they are parents? Millennials, the most transparent generation ever, continue to remain heavily connected online even after they become parents. Over 35% of millennial parents claim to have posted on Facebook in the last day. Millennials as a whole regularly trade private information for perks from brands they favor. However, that willingness falters a bit when millennials become parents, with 48% claiming they are less likely to give up private information about themselves in exchange for promotional perks. How do millennial men and women parent differently? When it comes to millennial parents, there are some distinct differences between men and women. Men are much more likely to say that since becoming a parent, they are the same person as before they had children—45% of men agree with that statement, but only 30% of women. With the growing number of two working-parent households, its not surprising that work-life balance is a key issue for both male and female millennial parents. Here there is strong agreement between the sexes—with 76% of men and 74% of women saying that work-life balance issues have become more important. The full content of the “Millennials as New Parents” study will be revealed at the 2013 Share. Like. Buy. 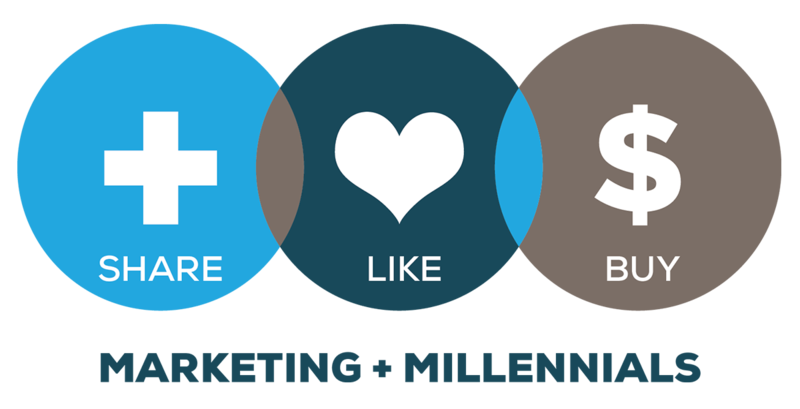 Millennial Marketing Conference on September 25-26 in Kansas City. For an advance look at verbatim survey answers or market-specific millennial data, please contact Jeff Fromm, Barkley, at jfromm@barkleyus.com or Erica Wren, Barkley, at ewren@barkleyus.com. From June 14th to June 20th, an online survey was fielded by Vision Critical and conducted and analyzed by Barkley among 1,001 randomly selected American adults age 25 to 34 that have children living with them, and who are Springboard America panelists. The margin of error—which measures sampling variability—is +/- 3.1%, 19 times out of 20. The results have been statistically weighted according to the most current age, gender, region, income, and ethnicity Census data to ensure a representative sample. Discrepancies in or between totals are due to rounding.